Askamore (pop. 550), the big moor or marsh, and its companion Askabeg, the little moor or marsh, lie under the western slopes of Slieveboy. Askamore is in the Parish of Kilrush (Cill Rois – “the church of the wood / copse”), which takes its name from an ancient church of which nothing remains. There is no townland of the name in the parish. The old Church of Ireland building and cemetery in the townland of Ballynaberney occupies the site of a C13th parish church dedicated to St Brigid. St Brigid.s church (RC), a T-shaped building with round arched windows and doors, was built in 1804 to replace a church burned in 1799, and was renovated in 1989. A plaque gives the names of all the priests who have served in Askamore, beginning with Rev. Michael Kennedy (1748-1779). The church marks the start / finish of a pleasant looped walk through the surrounding countryside. Kilthomas Hill was the scene of a major atrocity at the outbreak of the 1798 Rebellion. On 27th May the Shillelagh Cavalry and local yeomen attacked a gathering of about 300 suspected insurgents and killed up to 150, riding down those who tried to flee and burning cabins for miles around. Clohamon (Cloch Ámainn), a small, rural village on the River Slaney, is mainly noted for its meat factory. Clohamon Castle, one of several Kavanagh strongholds in the area, was occupied by Sir Edward Stukely in 1567 and destroyed in 1579 by Dónal Spainneach Kavanagh, a local chieftain who had spent several years in Salamanca, Madrid and Valledolid. In 1580 Sir Thomas Masterson, Seneschal of Wexford, took nearby Clonmullen Castle and had 40 family members and retainers hanged, drawn and quartered. Dónal retaliated with almost 50 raids on settlements and towns as far afield as New Ross over a three year period. The Clohamon estate was bought in 1625 by George Calvert (c.1578-1632), 1st Lord Baltimore, a Yorkshire-born adventurer ennobled with the name of a townland in County Longford, who built a new house where he made his plans for the New World, initially investing in Avalon (Newfoundland), but eventually founding the colony of Maryland. The property was damaged by English troops in 1643, during the Wars of the Three Kingdoms. Clohamon House, built in 1780 on the site of the 1625 house, is set in a neat garden sheltered by huge trees on a 180-acre farm that was in Sir Richard Levinge‘s family for many generations. The property is currently for sale. Bunclody (Bun Clóidí from bun clodaigh – ‘the end of the stony stream’) (pop. 2000) includes the adjacent villge of Carrigduff (Carraig Dúbh), which is technically in Co. Carlow. Although the original toponym Bunclody remained in common usage, the town was officially called Newtownbarry from the mid-C18th until 1960. Bunclody is a friendly town with an attractive mall and market square and several handsome buildings. There are over a dozen pubs and several good eateries. The stream that gives Bunclody its name is now dignified as the River Clody, a tributary of the River Slaney nearby, while a small canal flows down the town’s main street. 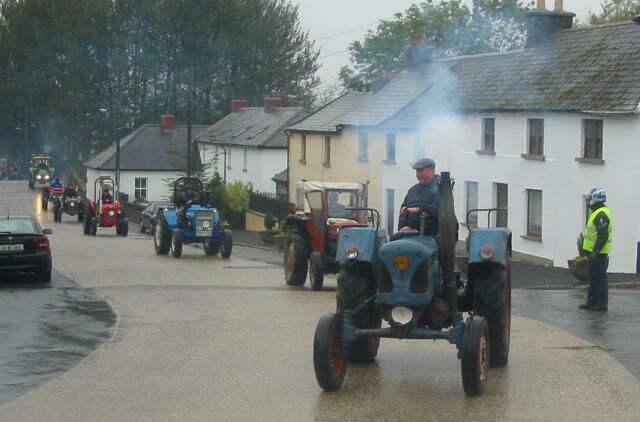 Bunclody hosts the Fr Frank Murphy Vintage Tractor Run during the annual Steam Rally at the end of July to coincide with the Eileen / Eibhlín Aroon Festival, named for the famous song dedicated to the “Mountain Rose” for whom local poet Cearúll Óg Ó Dálaigh wrote several love poems. Once part of the territories of the great House of Kavanagh and particularly of the sept of Art Bui Kavanagh, the McMurrough, titular king of Leinster in the early part of the C16th, the lands of Carragh Duff were confiscated in 1689 from Cathaoir / Charles Kavanagh, outlawed as a Jacobite officer (one of many killed in an explosion on board an English warship on which they were being held prisoners in 1690). The lands passed to Altham Annesley, 1st Baron Altham, second son of the 1st Earl of Anglesey (who also owned huge tracts in the area). The Altham title became mired in controversy when a young man in America claimed to be the rightful heir, having been sold as a child by his wicked uncle, who regained hIs ill-gotten position when the colonial mysteriously died in London while awaiting the outcome of his appeal to the House of Lords. Two generations later an issue of illegitimate birth further complicated the title, which finally became extinct in 1855 (although some argue that it is subsumed in that of Viscount Valentia, the current holder being a retired army officer in Zimbabwe). A consortium headed by a man called Barry bought the property in the early C18th. Barry’s daughter Judith married John Maxwell who became the 1st Lord Farnham in 1756. The Maxwell-Barry family built a fine mansion at Woodfield, and constructed houses to accommodate workers and tradesmen, forming the basis of Newtownbarry. The 1798 Rebellion saw insurgents led by Fr Mogue Kearns suffer a severe defeat locally on 1st June. Amongst those who took part in the battle was Miles Byrne, later to achieve fame in the army of France and author of two volumes of Memoirs. The Tithe War claimed its first victims in 1831 in Newtownbarry, when a crowd resisting the seizure of cattle in payment of Tithes was fired upon by the Constabulary, resulting in twelve deaths and twenty fatally wounded. This massacre came to be known as The Battle of the Pound. The Great Famine had a severe impact on the district, but even worse was an outbreak of cholera in its aftermath, when a temporary hospital had to be set up to cope with the overflow from the local Fever Hospital. The Maxwell-Barry family were forced to sell their 10,000-acre estate in 1861 to Robert Westley Hall-Dare, whose descendants remained as landlords of the town for many years after the Land Acts required them to sell most of the agricultural land to the tenants. St Mary’s church (CoI) is a beautiful stone edifice with an elegant spire, erected c.1775 and still maintained in pristine condition. The Chantry Restaurant, occupying the former Methodist chapel (c.1810), has lovely gardens sloping down to the River Slaney. Newtownbarry House, a very handsome mansion designed by Sir Charles Lanyon and built on the site of Woodfield between 1863 and 1869, contains a magnificent gallery used for interesting art exhibitions. The gardens feature beautiful old trees, a sunken garden, a rose garden and a lake. The Carlton Millrace Hotel (2004) overlooks the town and the 800-acre demesne of Newtownbarry House, now converted into a golf course. Bunclody is a good starting point for walkers, cyclists and motorists wishing to explore the Blackstairs Mountains. There are a wide variety of walks in the area, from country lanes through the wooded hills of the Clody River valley. The scenic Mount Leinster Drive leads to the slopes and summit of the highest mountain. Bunclody is on the N80 linking Carlow Town to Enniscorthy on ByRoute 3. Kilmyshall, a tiny hamlet, was once more important than Bunclody. Ryland’s Hill Cemetery, containing the 1632 grave of Dónal Spainneach Kavanagh, and of his son Sir Murchadh / Morgan, a colonel in the Kilkenny Confederacy army, who was killed in the Battle of Ballinvegga (near New Ross) on St Patrick’s Day 1643. The command of the regiment was taken over by his son, Dónal Óg, who led them with local clansmen to defeat by Oliver Cromwell‘s troops at the Battle of Clonegal in 1649. Buried in the same plot is Sir Murchadh’s daughter, Eilíonóir / Ellen / Eilleen, the Eibhlín Aroon made famous by the romantic (and factually inaccurate) song of that name, and her niece Eleanor Booth (d.1717), the only person clearly identified on the family gravestone. Templeshanbo (Teampall Seanbhoth) was named for an ancient church founded by Saint Aedan, who gave it to Saint Colman Ua Fiachra (The founder of Kilmacduagh). Saint Colman died in the first half of the C7th. An account in the Martyology of Donegal states that he was Abbot of the Monastery of Templeshanbo in Hy Kinsellagh, and was interred locally. The only part of this ancient church that remains is a portion of the semi-circular headed door-way in the Western gable and a stone font. The River Shanbo divides the two ancient burial grounds and the bank provides a perfect view of both grave yards and the handsome Victorian St. Colman’s church (CoI), built in 1850. Kiltealy (Cill Téile), in the foothills of the Blackstairs Mountains, is the highest village in County Wexford, with magnificent views of Black Rock Mountain and Mount Leinster. At the entrance to the village, a memorial plaque commemorates a local stallion, Sky Boy (1970 -1993), sire of champions. Kiltealy was the birthplace of the 1798 Rebellion insurgent leader, Fr Mogue Kearns, and of the celebrated Irish Tenor, Anthony Kearns. Kiltealy is near Killanne on ByRoute 3.